We’ve been an Atlassian Partner since 2007, and well… what a journey we’ve been through! From humble days as a software tracker, Jira is now providing enterprises with tools that drive strategy and tie everything to execution. This is real, not just a grand vision. Blended Perspectives helps our customers – some of the biggest institutions in North America – accomplish this in a way tailored to their needs. We believe that what customers most deserve is a trusted advisor, not only capable of delivering some of the most complex transformations using Atlassian tools, but one that is completely neutral and objective about what those tools should be. First and foremost consider us your Independent Consulting Solution Partner: we purposely don’t build or sell our own apps which means you, the customer, can be ensured of receiving unbiased advice and best practice recommendations. For over 12 years, our certified experts have been providing a full range of services and innovative, cost effective solutions for Agile, Scrum and Scaled Agile built on Atlassian products such as Jira and Confluence, along with many Marketplace apps. We consult to many industries and organizations in North America. We are an Authorized Training Partner in the USA and Canada. Please use the form below to download a PDF document outlining the features and benefits of working with us. Enjoy our whitepapers and subscribe to benefit from our other resources and tools. 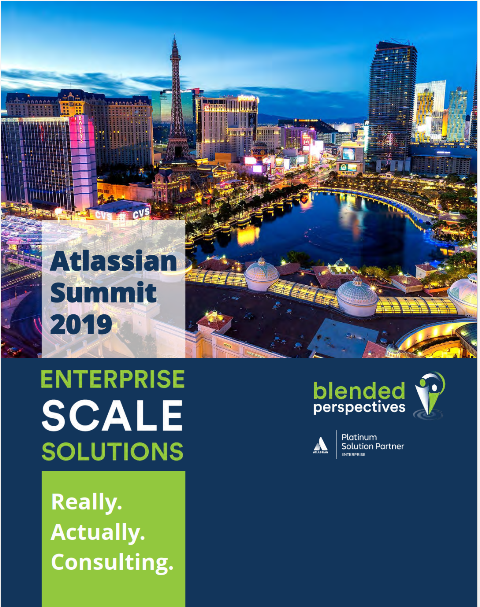 Blended Perspectives’ mission is to enable Corporations to unleash the power of their teams and to leverage the true potential of their business with enterprise level applications from Jira Software to the thousands of apps provided by Atlassian Marketplace.